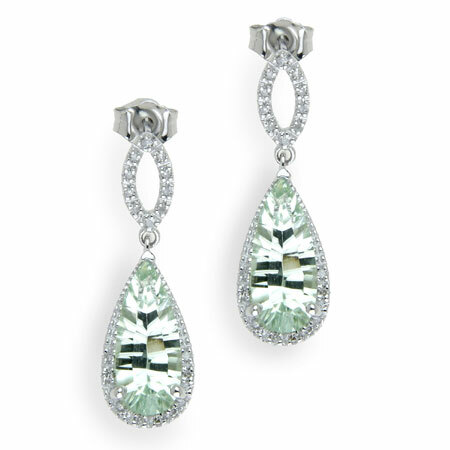 Undeniably beautiful and irresistibly attractive would be apt descriptions for this green amethyst and diamond drop earrings. Fashioned in the shape of a pear, there are two distinctive parts to this earring set with the pear-shape being the larger one but both are crafted from 925 sterling silver. The pear-shape also holds the green amethyst gemstone which is fancy pear-shaped and 4.95 Carats. The gemstone measures 14mm x 6mm in size and is further surrounded by 0.11 Carat diamonds. the The clasp is connected to the pear-shape by means of a smaller, sterling silver, diamond encrusted loop. In all the diamonds on the earrings total 36. We guarantee our 4.95 Carat Green Amethyst and Diamond Drop Earrings in Sterling Silver to be high quality, authentic jewelry, as described above.